Many initiatives were key in creating momentum for suicide prevention at state and tribal levels. Among these were the 2001 National Strategy for Suicide Prevention, the roadmap to guide states in developing state-specific plans. And the 2004 Garrett Lee Smith Memorial Act authorized $82 million in federal funding for states, tribes and college campuses to implement suicide prevention aimed at at-risk youth populations. 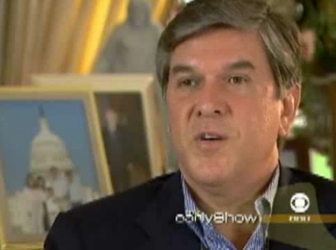 State and tribal funding for suicide prevention were jumpstarted in 2004 when President George W. Bush signed S. 2634, the Garrett Lee Smith Memorial Act, into law. The act authorized the spending of $82 million for youth suicide prevention programs at the state, tribal and college levels. 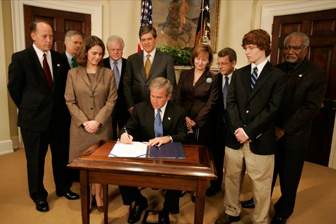 The legislation is named for Garret Smith, son of Sen. Gordon Smith, R-Ore., and Sharon Smith, shown standing directly behind the President. Their son died by suicide Sept. 8, 2003. With this federal funding and additionally $9 million in 2000 for a national suicide prevention crisis line, and another $9 million in 2002 to establish a national resource center for suicide prevention, states, tribes and colleges were equipped to fund prevention initiatives. What is your state or tribe engaged in regarding suicide prevention? Find key initiatives, contacts and progress via this interactive map at the Suicide Prevention Resource Center. As of July 2013, 592,580 individuals had participated in 21,433 training events or educational seminars provided by grantees of SAMHSA funding under the Garrett Lee Smith Memorial Act. Grantees often used their funds to provide suicide prevention trainings in their communities. The most common approach was gatekeeper training, designed to help trainees recognize suicide risk in young people, address the immediate needs of the youths, and refer youths to appropriate services. More than half (61.0% of 361,765) of trainees participated in state-sponsored events. More than one-third (34.5% of 204,351) of trainees were trained through campus-sponsored trainings and educational seminars. Additionally, 4.5% (of 26,464) in tribal-sponsored training activities. States are now migrating toward integrated measures to reduce suicidal behaviors among residents across the lifespan. This includes major policy initiatives designed to create the systems-level change necessary to reduce a state’s suicide death rates. This approach that integrates suicide with tobacco, alcohol, violence and other prevention streams is driven by state-specific suicide data, scientific research, and a state’s current prevention capacity. Additionally, states are turning attention to “upstream prevention” with early intervention strategies that state agencies and community partners can employ. This is in contrast to suicide prevention efforts which have typically focused on crisis intervention, case identification and treatment—in essence, waiting until someone manifests symptoms of suicide risk before intervening. In contrast, upstream suicide prevention approaches seek to prevent the very onset of suicide risk. There exist today theoretical and empirical evidence in support of upstream suicide prevention approaches. One such approach is the Good Behavior Game, a classroom management technique for early elementary students that demonstrated a 50% cumulative reduction in suicide attempts when those same students reached early adulthood. With the release of a 2012 groundbreaking task force report from the American Association of Suicidology, state legislators are beginning to mandate training for mental health, addiction, education and other professionals who interact with people at risk for suicide. In 2012 Washington became the first state in the nation to require mental health professionals and other frontline care providers to receive training in suicide assessment, treatment and management. The Matt Adler Suicide Assessment, Treatment and Management Act of 2012 (ESHB 2366), sponsored by Rep. Tina Orwall, passed the Washington State Legislature by overwhelming margins, with support from professional associations, veterans groups and individuals personally affected by this public health crisis. Other states are now following Washington’s lead, with legislation mandating training in suicide risk recognition, assessment, treatment and management for professionals in key practice settings.